Puppy Adoption Event in Newton this Saturday! 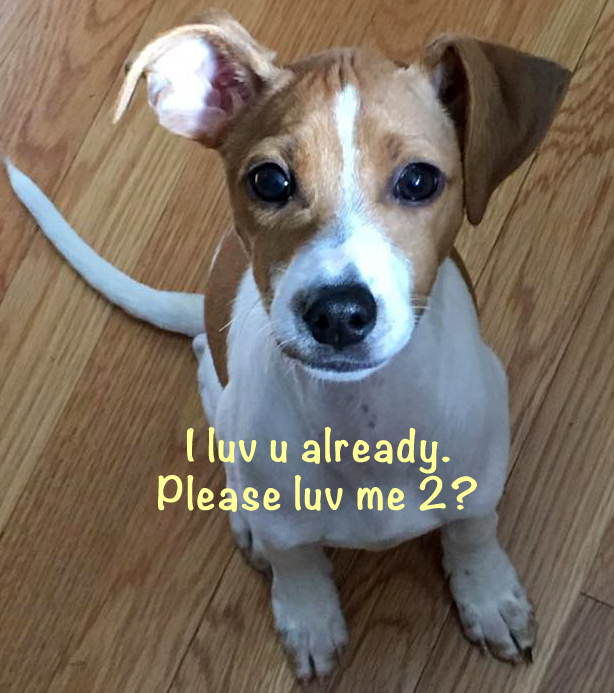 Puppy Adoption Event in Newton this Saturday! Puppy Adoption Event in Newton this Saturday! If you’re a dog lover and don’t have your own yet, or would like to find a new playmate for your dog(s), then this Saturday, April 16th, is your lucky day! Honda Village of Newton, in partnership with Last Hope K9 Rescue, is holding a special adoption event. About 25 dogs will be there looking for a new home. 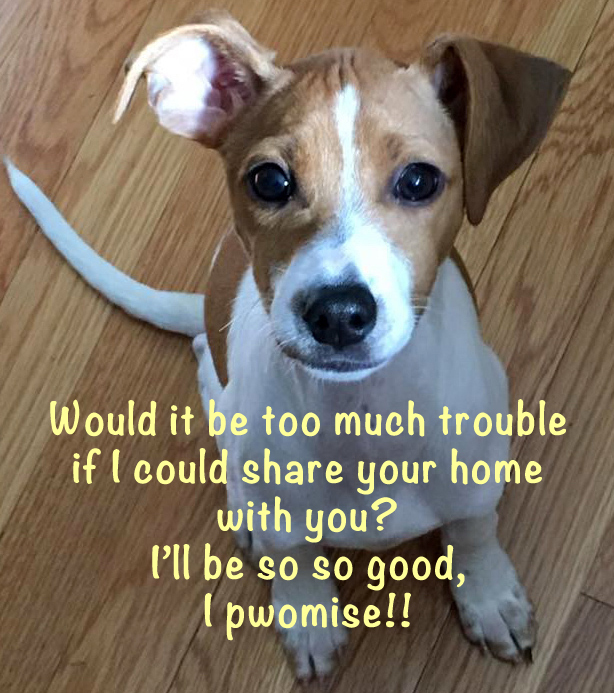 Why not open your own home to an adorable new puppy?!? It’s spring, this is the perfect time to get a dog. Just imagine walking on the beach with him/her or playing fetch in the park in the warm summer sun. Come on, you know you want to…. and if that’s not enough motivation, then cue up the Sarah McLachlan music and scroll down. Meet Alex A-Team, an adorable 3 month-old baby Chihuahua who is currently seeking his “FURever” home, and who will be one of the 20+ dogs attending Honda Village’s dog adoption event on Saturday, April 16th (if he does not find a home before then) in partnership with Last Hope K9 Rescue. 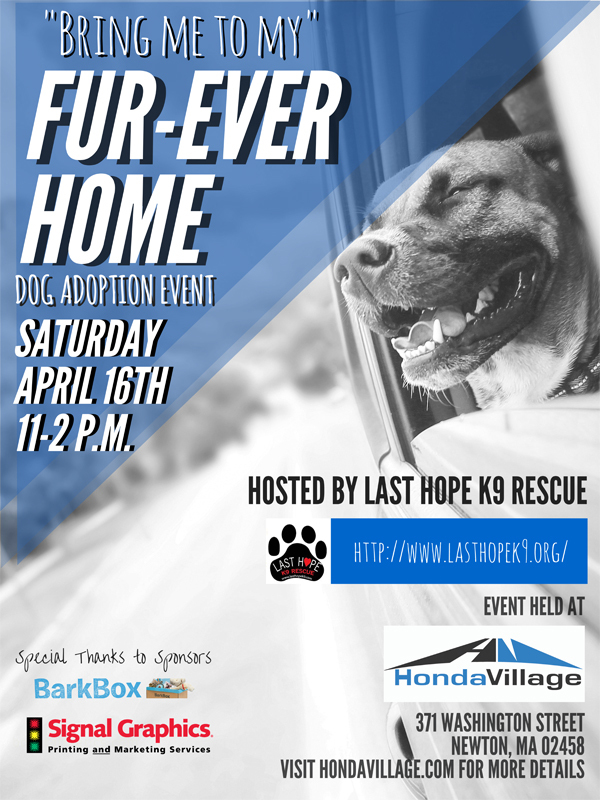 What: The team at Honda Village of Newton, part of Ray Ciccolo’s Village Automotive Group, invites all their fellow dog lovers for a dog adoption event they are hosting on Saturday, April 16th in partnership with Last Hope K9 Rescue. Last Hope K9 Rescue is an all-breed rescue dedicated to saving abandoned, neglected, and/or abused dogs from high-kill shelters throughout the US; they will be bringing about 25 dogs to Honda Village with the goal of finding them a “FURever” home, which could be with you or someone you know! A list of attending dogs will be announced 2-3 days prior to the event. Whether you’re looking to add a four-legged companion to the family, or just want to come show your support – Honda Village will be making it a fun-filled afternoon, with an employee dressed in a full pug costume posing for photos, a doggy photo booth and raffle prizes, including a Honda Puppy Basket, a BarkBox gift certificate, a complimentary vehicle detail gift certificate, and more! Leading up to the event, from April 11th to April 16th, Honda Village will be hosting a donation drive to “Fill a CRV” with dog-related items for the foster families. They are looking for items such as dog bowls, leashes, dog food and dog grooming supplies. Short on time but still want to help out? An online Amazon Wish List has been created, to make donating quick and easy! Recommended event parking is in the service garage; drive in and a valet will park your vehicle. RSVP: Guests are encouraged to RSVP to the Event on Facebook. If you do happen to go to this event and take home a puppy, please email me a photo of you and your new best friend at brian@wickedcheapboston.com and I’ll add it to this post. Or you can try adding it to the comments section below. Thanks!